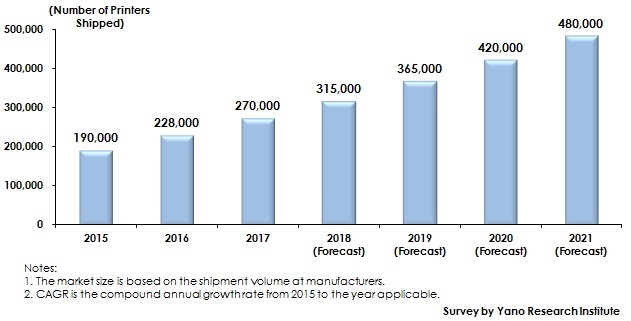 Yano Research Institute (the President, Takashi Mizukoshi) has conducted a survey on the global 3D printer market and has found out the trends by demand area, the trend of market players, and the future perspectives. The global three-dimensional (3D) printer market in 2017 rose by 18.4% to reach 270 thousand, based on the shipment volume at manufacturers. The market has been polarized between low-end printers costing less than 600 thousand yen and industrial high-end printers priced at 600 thousand yen or more. The market size in 2018 is expected to increase by 16.7% to attain 315 thousand. Due to evolutionary development of devices and materials, 3D printers have become more and more intended for creating and mass producing of final products primarily in Europe, for the industries including automobiles, medical, house appliances, and molds. Low-end printers, which tend to be used only for confirmation of the designs or prototypes, have continued being introduced especially in the education industry because of its keen interest in STEAM (an educational approach to learning that uses Science, Technology, Engineering, the Arts and Mathematics), but the growth rate has slowed down when compared with that in the past. On the other hand, high-end printers have shown remarkable growth especially those that use metal materials. The global market share of Japan in the 3D printer market based on the shipment volume at manufacturers accounts for 3.5%. This is likely to decline to 2.0% by 2021. Currently, the awareness to use 3D printers in Japan is relatively lower than other countries. However, in recent years, growing number of companies possessing multiple 3D printers in order to create various things have been on the rise in Japan. In addition, there are demands to replace or upgrade into higher-end printers, as more user companies seemingly eager to use 3D printers after finding out a certain level of advantages in using them. In recent years, the source of competitive advantages in manufacturing is likely to shift from the product quality, price, and delivery date to what values can be added by that manufactured thing. While a 3D printer, by a single entity, can create complicated-shaped products, no designing to take advantage of such a good characteristics has been carried out. It means that 3D printers have not been fully utilized in the Japanese manufacturing industry, and therefore, such an industrial shift has not been satisfactorily dealt with. In order for the domestic 3D printer market to grow more rapidly than it has used to, the people concerned have to consider educating human resources that can fully utilize 3D printers, in the wake of ascertaining what values can be brought about by utilizing the printers. 2.Research Object： 3D printer manufacturers, distributors, and software-related companies, etc. 3D Printers in this research indicate those devices for creating three-dimensional (3D) objects by laminating layers of resin or metals based on 3D data. There are several techniques for rapid prototyping depending on the methods or materials to use: FDM (fused deposition modeling), light modeling, SLS (selective laser sintering), inkjet, and etc.